Quick – how many folks songs do you know and can you sing right now? Follow-up, just as quick: How many of them are considered children’s songs? I recently had a chat with a coworker about the importance – and enjoyment – of singing. Not in a chorus, but casually and in a group. How his school had weekly singalongs with students, parents, and staff, and how much fun it was. How in my neighborhood we have sporadic but semi-regular neighborhood singalongs (you could call it a “hootenanny”), with food, guitars, and whatever other instruments happen by. It’s awesome. But I’ll bet that most Americans don’t have informal community singalongs and don’t make music with each other for fun. As a music teacher, this of course upsets me. As a human being, this upsets me! Because when you look at it, our *lack* of communal music-making is a weird anomaly in Western history. And it’s fairly recent (and I hope short-term) anomaly. I read an interview with the classical composer Milton Babbitt, and he said that when he was growing up in the 1920’s, *everyone* played ukulele. Jazz Pianist Billy Taylor described a childhood where everybody could sing and play one or two songs on piano – and they didn’t consider themselves musicians, they were just people who enjoyed music. 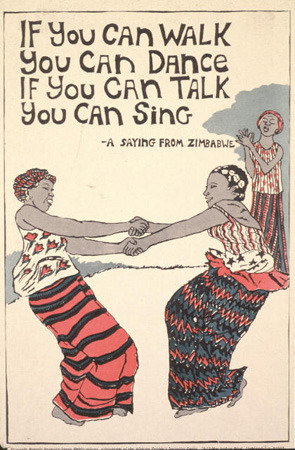 Blacking hypothesizes that music, throughought the rest of human history, was assessed by the degree to which it furthered social harmony – in other words, if a song lends itself to people getting together and singing and playing it for fun, the community judged it as “good.” If it was ill-suited for community music-making, the song was bad. (tough luck, dubstep.). Does that describe American society now? Nope. When did we lose our belief that everyone can make music? Coming tomorrow – my best-guess answer, and what we can do about it. This entry was posted on July 19, 2012 by natetrier. It was filed under Uncategorized .